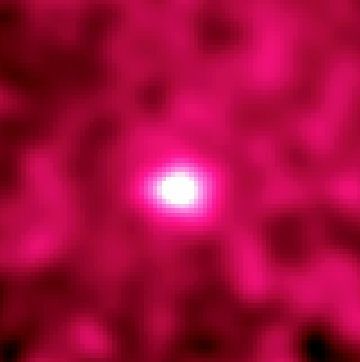 Could we see a gamma ray source on the Moon? Gamma rays are one of the highest energy forms of light in the Universe - its wavelength is around a picometer (that’s 10^-12 meters), which is roughly the same order of magnitude as the size of a hydrogen atom. These wavelengths are a thousand times shorter than that of visible light. The high energies of gamma rays means that this form of light is extremely damaging to life. Ultraviolet (UV) light doesn’t penetrate far into your skin - it can damage the surface layers of your skin, giving you a sunburn, but it won’t damage anything past the first few layers of your skin. (UV light will, however, increase your chances of skin cancer, if you get severe sunburns.) Gamma rays can penetrate much further into your body, and can destroy or alter the DNA within your cells, causing drastic changes to the replication instructions of your cells. This can cause radiation sickness and/or cancer to appear, but with no surface burning of your skin. Fortunately, our atmosphere is opaque to gamma rays, so the average level of gamma radiation coming towards our planet is blocked out by our atmosphere. Our atmosphere does a wonderful job of protecting us from the beating our cells would otherwise be taking. On the other hand, the fact that our atmosphere is such an effective wall to this wavelength of light means that we can’t observe any of the gamma rays produced elsewhere in the universe (which is a very interesting field with a lot of science to be done) from the surface of the Earth. In order to look at this light, we have to put our telescopes into space, outside of our atmosphere. At the moment, we have the Fermi Gamma Ray Space Telescope observing the whole sky for gamma ray sources; that telescope produced the map of the sky at the top of the page. The bright line through the middle is all gamma radiation from within our own galaxy. Anything far away from that central region is probably coming from another galaxy. Individual bright points in our galaxy are likely to be coming from the aftermath of a supernova. The moon, unlike the Earth, doesn’t have an atmosphere to protect it from any kind of battering, which means that there’s a constant flow of high energy light and small particles pounding into the surface of the moon. One of these objects smacking into the surface of the moon is called a cosmic ray (which is a highly accelerated tiny piece of grit - most of them are protons). Cosmic rays are constantly streaming throughout the universe. When they smash into the surface of the moon, they can create gamma radiation as they come to a stop. Something here unclear? Have your own question? Feel free to ask! Or submit your question through the sidebar, Facebook, twitter, or Google+! Note from the administration: Astroquizzical has a new url! All the old links should still be functional, but should redirect you to the brand new astroquizzical.com domain. Thanks for reading!